Wechat is a mobile text and voice mesasaging communication service developed by Tenchent in China ,which is a very hot IM tool, even every people which have a smart phone will use Wechat. So when you come to China, please learn it, then you will know it’s a wonderful soft. Wechat is available on Android, Iphone, BlackBerry, Windows Phone and Sybian phones, and there are also Wen-based and OS X clients, you only register an account, then you can use Wechat everywhere. 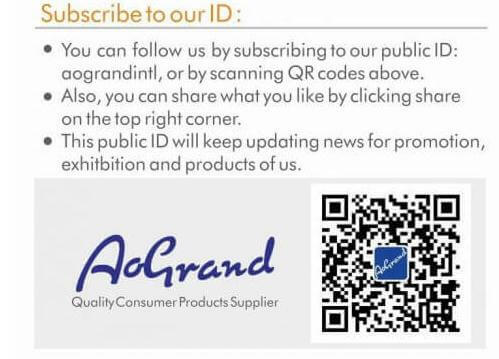 Please scan the 2D barcode below immediately, also you can search our ID: AOGrandintl, start your new life with smart phone, easy and funny.